Join us in our time warp to eras gone by, bring out your puffiest sleeves and turtle necks, find your retro style, and of course.. RSL drink prices were standard. Wine and Yoga hosted upstairs at the RSL. Join Bernadette for a gentle yoga class to start your Friday evening! The casual class costs $15 and includes a glass of the wine of your choice to be enjoyed during yoga. Bring along your favourite game, your offspring (as long as they are over 16), your granny, or a friend. Learn a new game or play an old favourite. The Flemington & Kensington RSL has a fully licensed bar, so you can partake of liquid refreshments whilst playing your favourite games, and meeting other local gaming folk. And you can bring a long your own grub. Join us for our last Sunday evening of live music with Karen, Steve and Pete for 2018!! This event is FREE, so come along, support live music in our community and a local community venue. Join us in our time warp to eras gone by, fashion turned pastel, included bright colours, disco and glitter, and RSL drink prices were standard. This year marks the 100th anniversary of the end of World War 1. Hostilities formally ended "at the 11th hour of the 11th day of the 11th month", 1918 in accordance with the armistice that was signed with Germany. 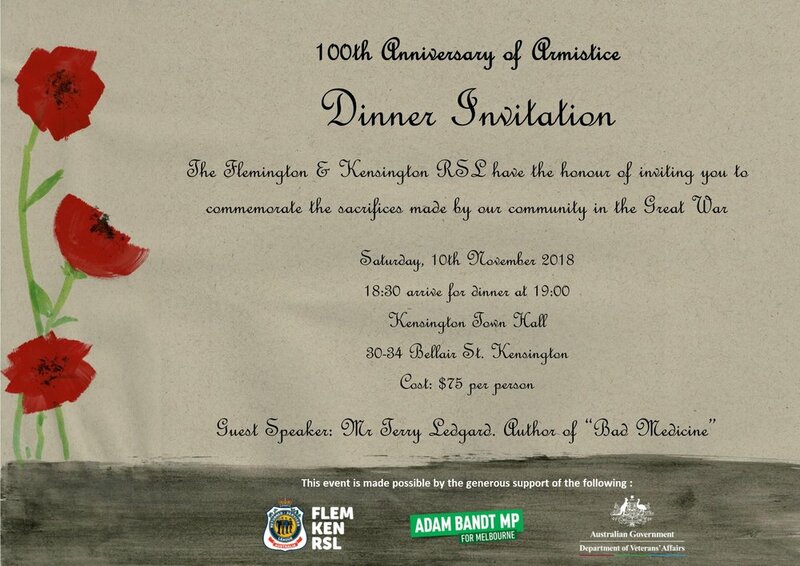 The Flemington & Kensington RSL, with the support of Mr. Adam Bandt MP and The Department of Veterans Affairs, would like to invite you to dinner to commemorate and remember the men and women from Flemington & Kensington that served and sacrificed. Join us in our time warp to eras gone by, when sleeves were puffier, corduroy was in fashion, and RSL drink prices were standard. Join us for a Sunday evening of live music with Karen, Steve and Pete.This event is FREE, so come along, support live music in our community and a local community venue. It's AFL Grand Final Time! Watch it LIVE and local; support your local Community venue.